Come out to the gym track for the Defender Olympics May 15 at 10 a.m. 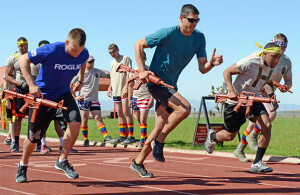 Challenges will include a one minute, four-man push up challenge, 200 meter ammo can relay (4×200), mile relay (4×400), 50 meter high crawl relay, 1600 meter Indian sprint relay, 50 meter serpentine fireman carry relay, and MRE eating contest. For signups, contact Tech. Sgt. Bronsha Smith by email at bronsha.smith@us.af.mil or by phone at 661-277-2103. Team Edwards and the 412th Security Forces Squadron will observe National Police Week with a slate of events May 14-18. Police Week is a time designated to remember and celebrate past and present civilian and military law enforcement officers, as well as the survivors of those who make the ultimate sacrifice in the performance of their duties. The week is observed to ensure they are not forgotten. In 1962, President John F. Kennedy signed Public Law 87-726 designating May 15 as Peace Officers Memorial Day and the week in which May 15 falls as National Police Week. The law was amended by the Violent Crime Control and Law Enforcement Act of 1994, Public Law 103-322, signed by President Bill Clinton, directing the United States flag to be displayed at half-staff on all government buildings on May 15 each year. While the actual dates change from year to year, National Police Week is always the calendar week beginning Sunday, which includes May 15. Below are a list of events along with contact information if anyone would like to participate. 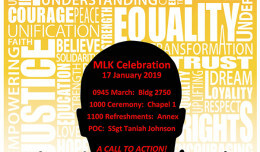 Everyone is encouraged to come out and help make these events the best they can be. 7:30 a.m. — Defender’s Prayer Breakfast at Club Muroc to bless the upcoming week’s events. Breakfast will be served for purchase. To signup, email Staff Sgt. Kaylah Cousin at kaylah.cousin@us.af.mil or call 661-277-3693. 9 a.m. — A security forces display will be conducted at the Desert Junior-Senior High School football field. Demos will be provided by the Combat Arms Training and Maintenance, Military Working Dog Section, Air Force Office of Special Investigations and McGruff the Crime Dog. The local JROTC will be posting the colors at 10 a.m. to observe the start of Police Week. Event is scheduled to end at 12:15 p.m.
10 a.m. — Defender’s Olympics. Four-member team competition located at the base track by the gym. Challenges will include a one-minute, four-man push up challenge, 200 meter ammo can relay (4×200), mile relay (4×400), 50 meter high crawl relay, 1600 meter Indian sprint relay, 50 meter serpentine fireman carry relay, and MRE eating contest. For signups, contact Tech. Sgt. Bronsha Smith by email at bronsha.smith@us.af.mil or call 661-277-2103. 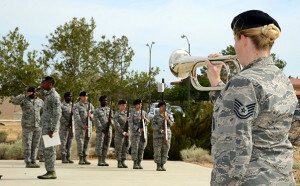 Members of the 412th Security Forces Squadron at a past National Police Week retreat ceremony at Edwards Air Force Base, Calif.
7 a.m. — For the Fallen Ruck March. A 14 kilometer ruck march located behind Fire Station 2. For signups, contact Staff Sgt. Dwayne Morris by email at dwayne.morris.3@us.af.mil or call 661-277-7988. 10 a.m. — Battle of the Badges. Show your support as the Edwards Fire Department challenges 412th Security Forces Squadron to a volleyball game at the base gym. 2 p.m. — Over 30 vs. Under 30 Basketball Game. Show your support as defenders from these age groups battle each other to determine basketball superiority at the base gym. 8 a.m. — Police Week Golf Tournament at Muroc Lake Golf Course. Prizes and raffles will be available. Contact Staff Sgt. Zachary Moitoso to register at zachary.moitoso@us.af.mil or by phone at 661-275-2888. Noon — National Police Week Closing Ceremony at the Airman Leadership School Drill Pad. 412th Security Forces Squadron, Air Force Office of Special Investigations and local law enforcement agencies will honor those who made the ultimate sacrifice. For any questions regarding any of these events, contact Staff Sgt. Edgar Guzman by email at edgar.guzman@us.af.mil or by phone at 661-277-6901. Alternate contact for these events is Staff Sgt. Valerichanel Ibarra at valerichanel.ibarra@us.af.mil or 661-275-2270.